Behind every creative endeavor, there is a story of how it came to be. 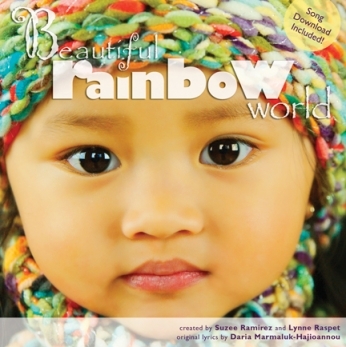 This is the true story of how our project “Beautiful Rainbow World” was sparked. After Lynne and I had given birth to our two oldest, Ellie and Paris, we were both so enamored with their unique beauty as both of them were ethnically “mixed” race. It was fun for Lynne to discover Ellie’s curls, and for me to cherish Paris’s almond-shaped eyes… and both of them had a beautiful caramel tone to their skin. We wanted to celebrate this unique beauty and thought of doing a photography book of mixed-race children. We called the project “Mixed Blessings”. We contacted local chapters of multi-racial organizations, spread the word verbally and started to get some photo submissions for our project. However, most of the photos we were receiving were small prints from the 60s, 70s and 80s. This was before digital photos and were the norm, the internet was not as “friendly” as it is now, and also before Lynne had discovered her talent and passion for photography so she was not yet involved in that world. A few more kids between us, and lots of life, and the project never died but definitely dwindled. We never stopped talking about it though. We bought Multicultural Kids as way to start selling cultural educational products and learn more about the publishing industry. I had also joined a local organization called Melting Pot Moms started by the amazing Angela Williams. A couple of years after joining MPM, Angela posted about a photo shoot that was taking place for a book about mixed race children! I was heart-broken, and yet validated as well. I had the opportunity to take my daughters for that shoot, but couldn’t bring myself to do it – it felt like our dream project was dissolving before my eyes. That book, “Mixed”, by Kip Fulbeck was completed successfully. The Japanese American National Museum had a full exhibit dedicated to the book and through Melting Pot Moms we were invited to attend the opening for which the Today show was going to be there to conduct interviews. As I was driving up to that event with my dear friend Sandy, I was telling her that this was bitter-sweet for me in that our “idea” for a photography book about mixed race children was now completed, and not by Lynne & I, but the idea had been fully validated by the museum and also the Today show. Immediately (creatives, you know what I mean! ), the idea for this new book popped into my mind! Use this song and create a book that not only celebrated mixed-race children, but ALL children… so beautiful and unique, each and every one! So, that was three plus years ago, but Lynne and I never, never, let this dream die. It may seem simple to some folks, but it is something that speaks to our hearts. We feel it is a book children will enjoy reading again and again, singing Daria’s beautiful words while looking at the photos. Possibly in doing so, that in-born knowing and acceptance of others will stay with these children ~ and touch the adults reading and singing along with them. time + patience = wow!